Reaching this amazing amount of money would hugely reduce the amount we need to borrow and allow us to get our plans up and running more effectively - thank you so much for your help. We look forward to welcoming you and making our space ace from the new launch start! In 2019 Hop Hideout will be moving to the city centre of Sheffield into a hugely exciting new development and phase for the Castle Gate area. Castle House aka the Co-Op building is being transformed by Kollider as an innovative food hall called Kommune with acclaimed, independent, kitchens and retailers. And we're extremely excited to be joining this project with a Hop Hideout concession - bringing our existing beer shop and tasting room vibes to this inspiring development. 'Kommune brings Sheffield’s landmark Castle House back into use as a vibrant, communal place, forming part of the Kollider project, which is aimed at transforming this significant building and historic area of our city centre. We've built up a great reputation for quality craft beer (we used to say speciality beer when we first opened back in 2013! ), cider and more already and this move would enable us to do something we've been dreaming of. We would also offer specialist natural, biodynamic and organic wines, exceptional spirits and cider - a one-stop shop for great quality drinks to take home. The food hall space would enable room for art and photography exhibitions and scope as a creative hub. It's important to us to create a characterful place that is welcoming to all. We believe a thriving independent business scene is important to Sheffield and we want to continue to be part of that. We've a handful of the usual pinch points including planning, building work and tight timelines and we look forward to working these through, but it's always a challenge and we hope you can understand these pinch point areas. Our hopes are high, after putting together all the best bits of the things we love from beer to cider, events and more. In addition after winning the Drinks Retailing national award for best UK independent beer retailer in February 2018, we are ready to move on to the next stage of our development and we'd love for you to join us on our journey. We are putting together this fundraiser to reduce borrowing and engage with our customers (you! ), while offering our existing and future customers something in reward for supporting our ideas. With the money we raise it'll help towards legal, planning, paperwork and fit out costs. We especially want to make sure the beers, ciders and wines are cold stored, to provide you, the drinker, with a quality experience all-round. If we over fund we will also be able to potentially add more snazzy equipment and merchandise. We can also invest more energy in kitting the cellar so we can house and age more beers such as stunning Belgian Lambics and big imperial stouts (and Orval!). We hope to be a great addition to the local businesses, complementing the food and drink businesses in the area, offering something different and high quality. We're thrilled at the possibilities of food collaborations with independent kitchens in this social dining space and the events we can host. Keeping a focus on the things we love to do. Since 2013 we've hosted over 100 events including 'meet the brewers' from the likes of Cloudwater, Deya, Marble, Wylam, Siren, Elusive, Abbeydale, Northern Monk, Torrside, Dugges, Brooklyn, Founders and Magic Rock Brewing; our monthly Sheffield chapter Mikkeller Running Club and events with beer writers such as Pete Brown, Melissa Cole and Matt Curtis. In addition to Jules being director of city-wide annual beer celebration Sheffield Beer Week and launching Sheffield's independent craft beer festival in 2018 - Indie Beer Feast. Hop Hideout is an independent beer-focused business which was started in late 2013 by husband and wife team Jules Gray and Will Linford through a shared passion for good beer. We have garnered a superb reputation for our beer shop and tasting room, initially situated in the neighbourhood of Abbeydale, Sheffield. Winning two national awards (Celebrate British Beer) and being featured on Sunday Brunch's website and in national newspapers such as The Independent. We also offer mail order, home delivery and click & collect options via our website lovingly curated by our photography virtuoso and co-owner Will Linford. This is the next step for us to develop our ideas and grow. There is an element of unpredictability regarding timings of launch; as with all construction/redesign projects. We are aiming to be open in late February of 2019. But we will keep everyone updated via mail outs and social media, so you can share along the way on our journey.  This crowdfunding campaign is aimed at rewarding the people that support us in our next steps. The rewards include generous gift cards (which you can use in store or on our website for mail order/ click & collect / home delivery - on beer and cider), limited artist designed merchandise and beer tastings. We don't expect to fund the whole venture through this crowdfunding, but we hope to reduce borrowing costs. We also hope to fill our space with beer lovers from the start. In return get to spend your money on our 4-strong tap list and chilled 300-wide bottle/can beer and cider selection. We hope to share a beer with you all when we launch! The Fiver: A massive thank you from us. Every bit will help and we look forward to welcoming you as a customer. We will tweet a thank you prior to launch to everyone. Please put your twitter handle in the pledge box. Limited edition artist designed reward - enjoy a Happy Murray Birthday Hop Hideout tote bag designed by Ben Cooney and inspired by Bill Murray. Whit whooo! Can be collected in store or posted (in the UK). Please advise on pledging which preferred. Available for collection once Hop Hideout is open, we will confirm date once printed. 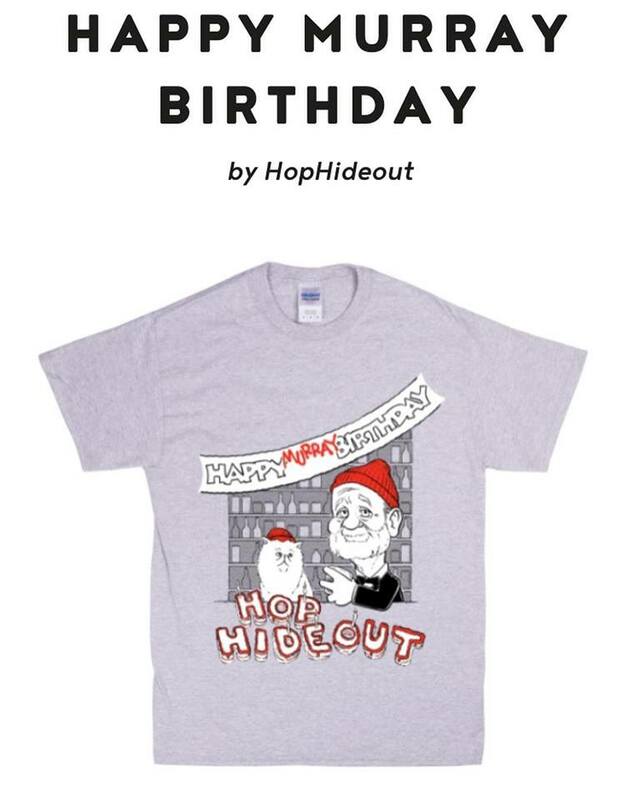 Limited edition artist designed reward - enjoy a Happy Murray Birthday Hop Hideout t-shirt designed by artist Ben Cooney and inspired by Bill Murray. Whit whooo! Can be collected in store or posted (in the UK) - in a choice of your size - Small, Medium, Large, X-Large, XXL. Collect in store or have posted (to UK address) options available on this reward. Please let us know in notes on your pledge which preferred. When ready will be emailed. Enjoy a hosted beer tasting at Hop Hideout (Kommune). £20 for 50 mins, for 2 people and 5 x thirds of beer per person. This is similar to the beer tasting we offered on Groupon and was a great success - we delivered over 350 tastings! We may hold the beer tastings in groups, for info. You will need to book a date and time within our business opening hours. Book within 12 months of your e-mail voucher being received. Pledge £200 Guided Beer Tasting for you and your friends, for up to 10 people hosted at Hop Hideout (Kommune). We'll host a guided beer tasting of a theme of your choosing. Includes 5 thirds of beer per person and snacks to share. We will curate a night of tasting and chatting just for you and your friends. This can be booked within our opening hours within 12 months of launch date.